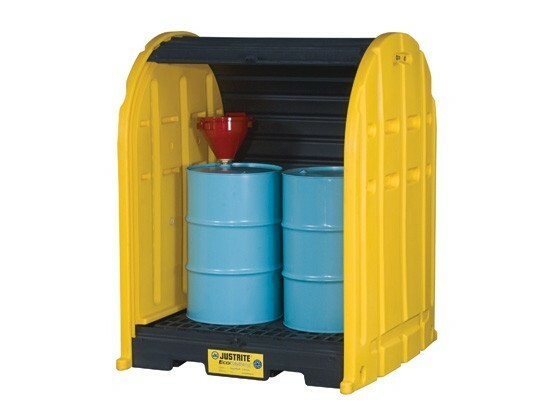 Safely Store 55 Gallon Drums Outside Protected from the Elements. Running out of floor space in your warehouse? 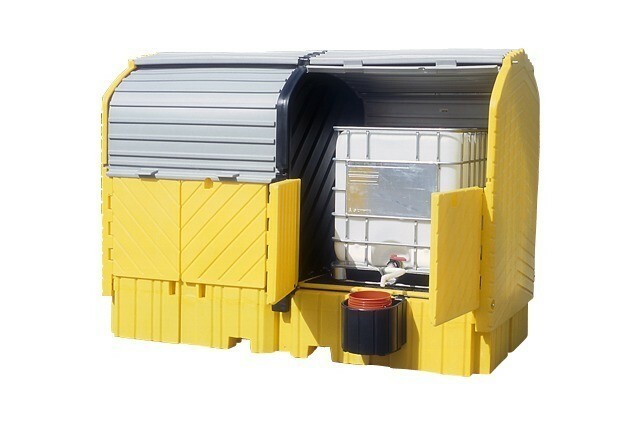 Consider moving your 30 or 55 gallon drums outside into one of our covered spill containment units. Select from 1 to 20 drum units in various models. 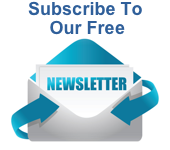 We have one of the largest outdoor drum storage selections on the internet along with free phone or email help if needed to make your selection. 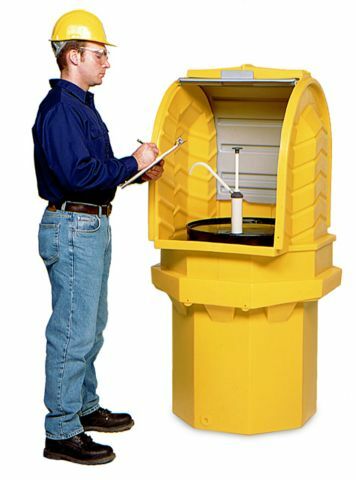 All spill containment drum storage units are made of weather resistant polyethylene for durability and dependability. Will not rust or corrode. 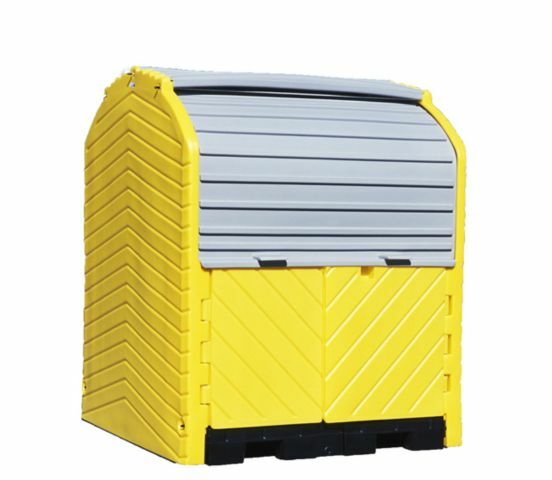 All of our outdoor drum storage models have easy slide roll top covers that slide up and out of the way except for the gull wing units with a lift top. 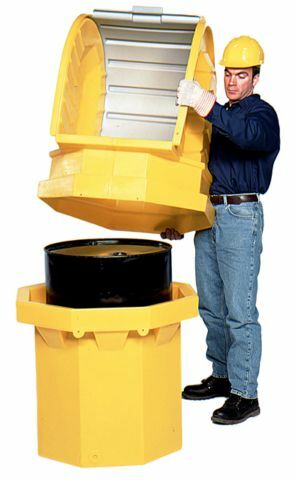 Every spill containment drum storage model has enough head space above the drums so drum pumps or funnels can remain in place with the unit closed up. 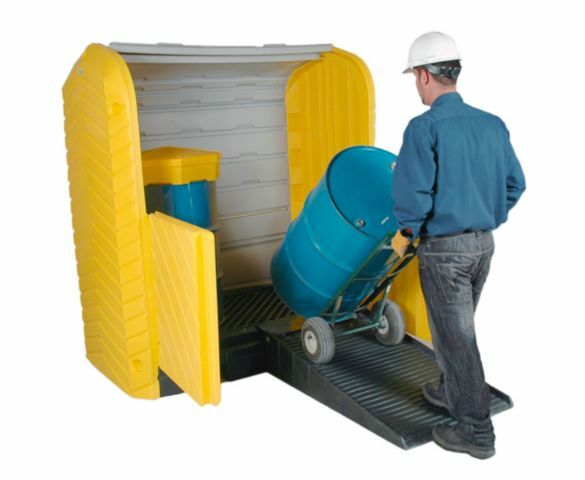 Access to load or remove drums is quick and easy because of the slide up covers and/or access doors. With forklift access or with a drum cart with the optional ramp, drum movement is simple. 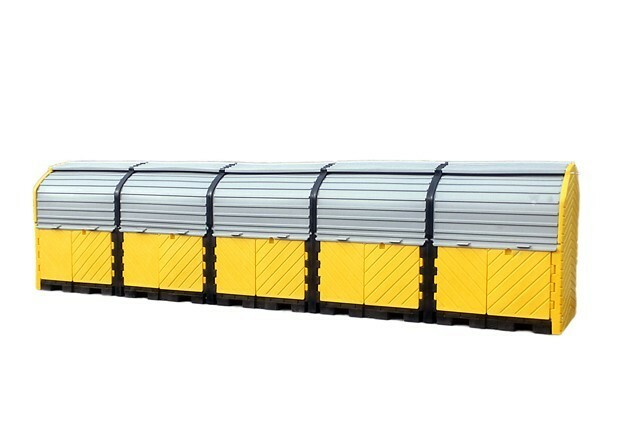 Low profile containment pallets allow for easy movement and use of drums. These leak proof spill pallets come with or without drains. See item descriptions below for this feature. 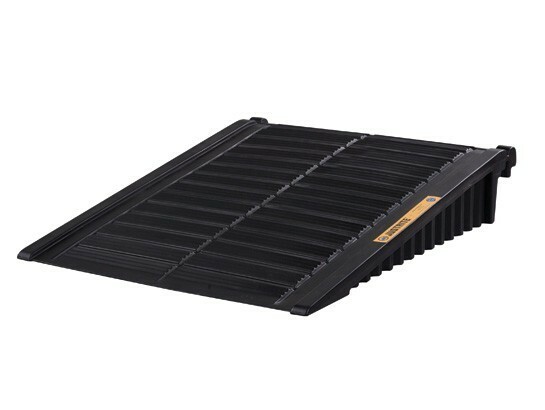 The light weight removable deck grating makes cleaning up any capture spills or leaks easy. 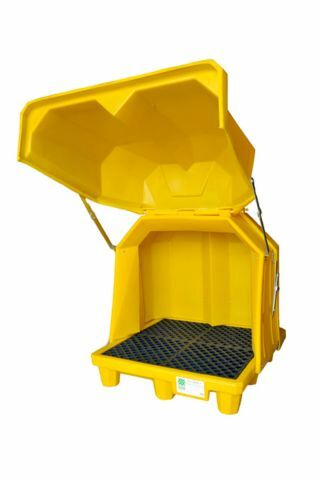 If you have chemicals that you need to control because they are expensive, are hazardous materials or for safety reasons then you need these lockable spill pallets. 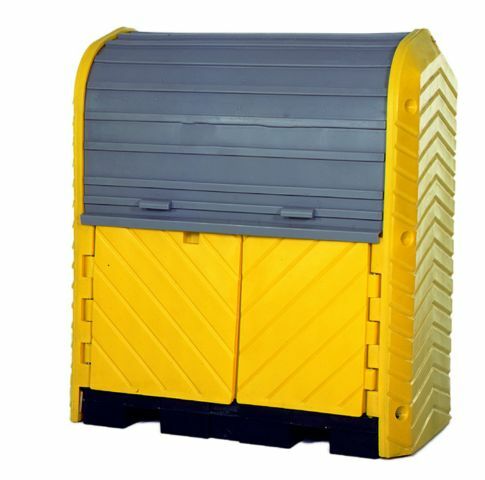 All of the drum pallets on this page accept padlocks (not included) to secure the contents on the pallet. Use indoors or outdoors. 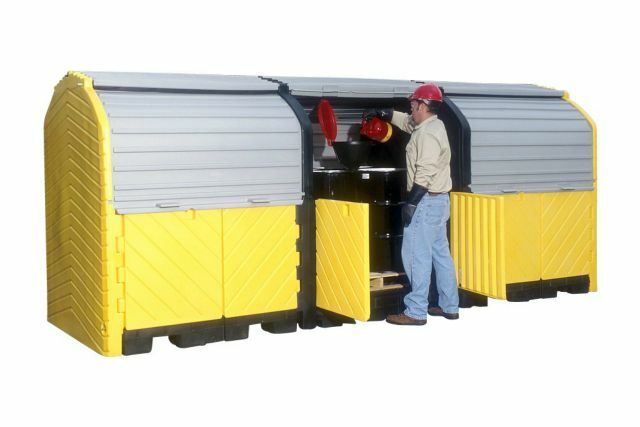 All units are manufactured so they can be moved with a forklift, with or without drums on the pallet. 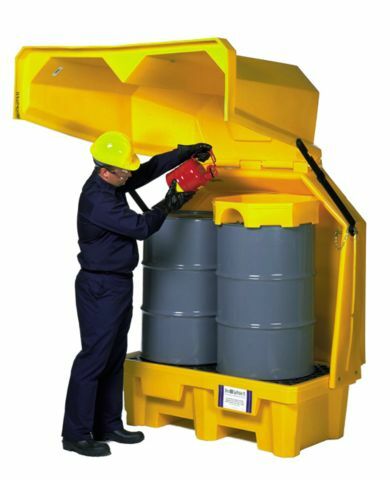 Our spill containment drum storage products are made in the USA. 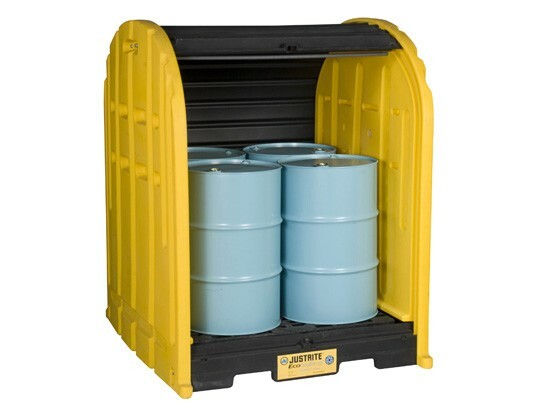 These spill containment drum storage units are mad of polyethylene plastic and are constructed to last for years indoors or outdoors. 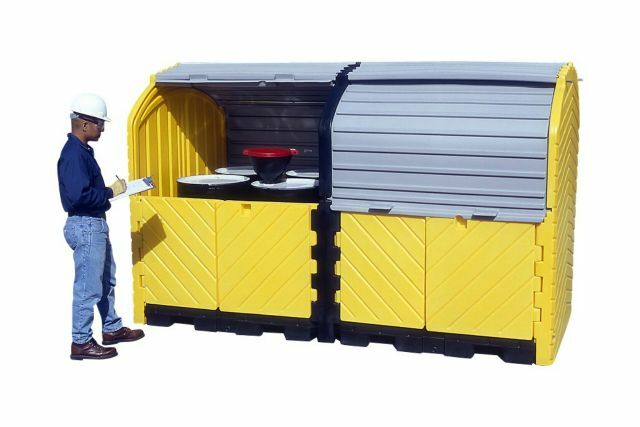 The polyethylene material is UV protected for extended outdoor use. The products are rated for temperatures from -40 degrees F to 160 degrees F.
The exterior and interior can be cleaned with soap and water. 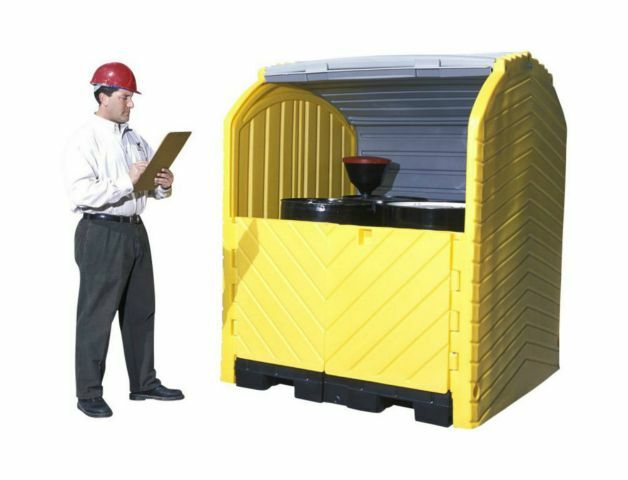 The sump area of the pallet should be checked on a regularly for any leaks. Cleanup will depend upon the type of chemical that leaked or spilled. Use all safety precautions necessary for handling the spilled chemical involved. After the major part of the spill/leak has been cleaned up, wipe down with absorbents the inside of the containment unit to remove any remaining residue. 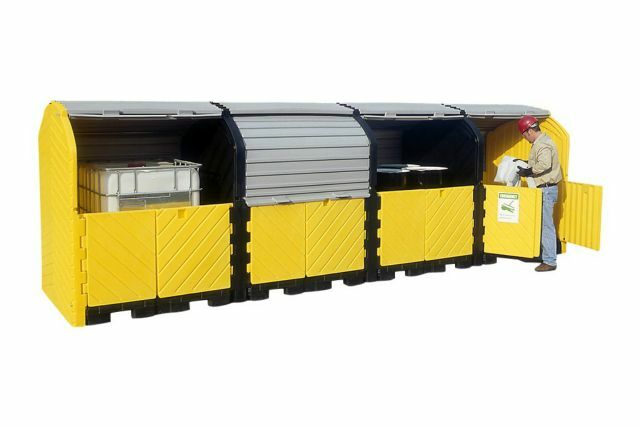 Properly dispose of all material according to local, State and Federal regulations. To complete the cleaning wash the containment pan and grates with soap and water. Ramp for items ending in U - Black - Non- slip polyethylene. Dimension 55.5" W x 28.5" D x 8.75" H. Load Capacity - 700 lbs. Weight - 43 lbs. WARNING: This product can expose you to chemicals including lead, nickel, which is known to the State of California to cause cancer and birth defects or other reproductive harm. For more information go to www.P65Warnings.ca.gov. 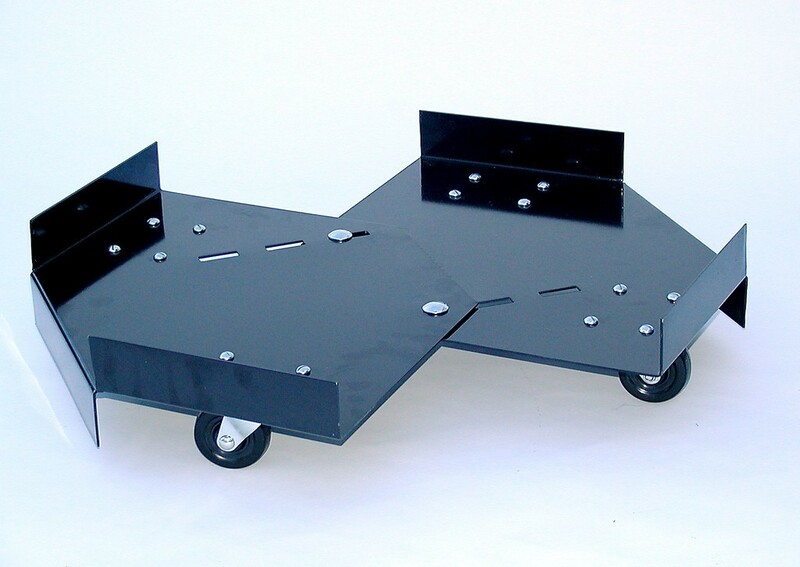 Dolly for Drum Spill Trays Items A9640U, A9641U, A1045U and A1046U ONLY - Dolly Weight Capacity 800 lbs - Steel - Height 5" - Color Black - Caster Material Polyolefin - Four 3 inch casters - Dimensions - 26.5" x 26.5" x 5" - Weight 35 lbs. WARNING: This product can expose you to chemicals including nickel, which is known to the State of California to cause cancer and birth defects or other reproductive harm. For more information go to www.P65Warnings.ca.gov. Thank You For Shopping Absorbents Online! Your Clean-Up Source! XML Site Map © 1999-2019 All rights reserved worldwide.